My name’s Andy and I live in the uk. I’ve discovered your fantastic site back in September so I’m a newbie to JCH, but I check the site every day now so I hope I’m making up for it! I’ve been into photography as a hobby for quite a few years. The last two or three of which I’ve been using fuji’s x-e1 followed by the x-e2 and a couple of the excellent fuji lenses. I think it’s a fantastic system but back in September I decided I wanted to return to 35mm photography mainly as I wanted to have some actual tangible negatives as opposed to digital files stored on a computer, and also I was kind of getting bored of the use of photoshop/critical sharpness/digital look and feel to my photography. So I sold some guitar pedals (my other hobby) and bought the last brand new voigtlander bessa r4m in the uk along with the 35mm f1.4 nokton. I’m hoping to add the 21mm f4 lens to the setup next year when I get some pennies saves. I’ve always fancied one of the voigtlander bessa rangefinders and figured it would be a good system to run alongside my fuji setup. I’m exceptionally pleased with it, and have just received a Patterson film processing kit as a Xmas present with the ultimate aim of turning our cellar into a darkroom next year. 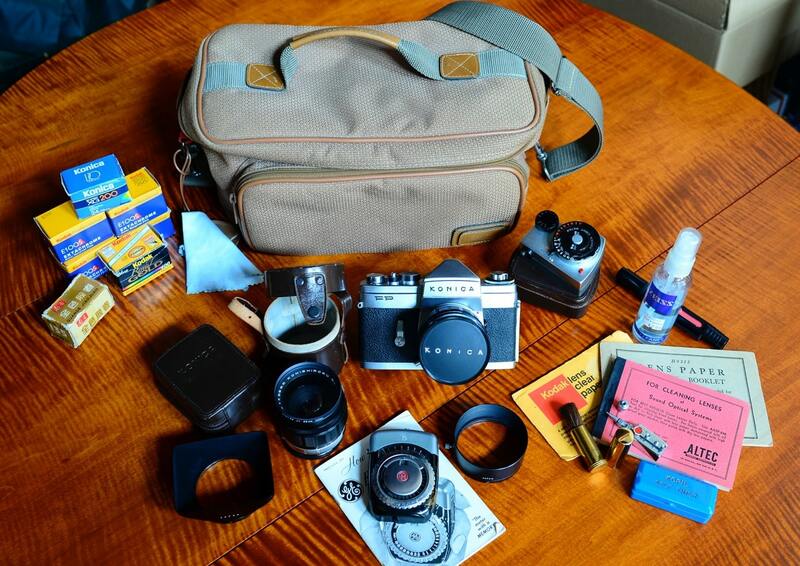 Anyway… I thought I would submit a couple of pics of my 35mm bag setup to your great site, hopefully it’s of interest to your readers. Voigtlander bessa r4m with 35mm f1.4 nokton and luigi leicatime deluxe strap attached. Japan camera hunter film container with hp5 and tri-x inside. Thankyou so much for the great work you do on the site! It’s very much appreciated! 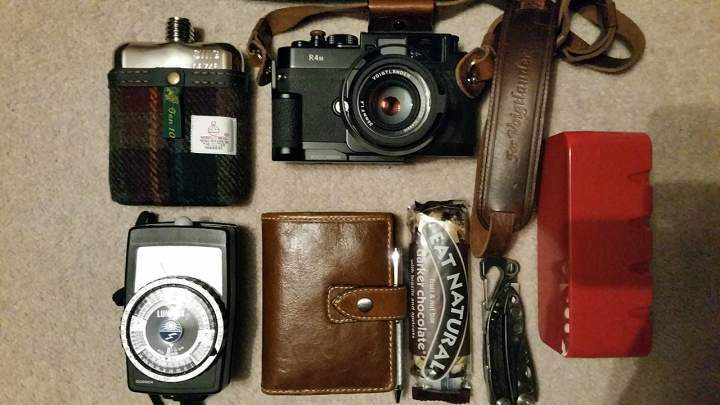 Thanks for sharing your bag with us, Andy. I wish you had shared some links too. What’s in the flask? Highland? Speyside? 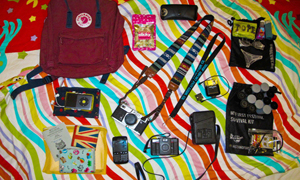 I want to nominate your bag for “Bag of the Year” [ hint, hint Bellamy!] one the sole basis of the 15 year old s/malt. 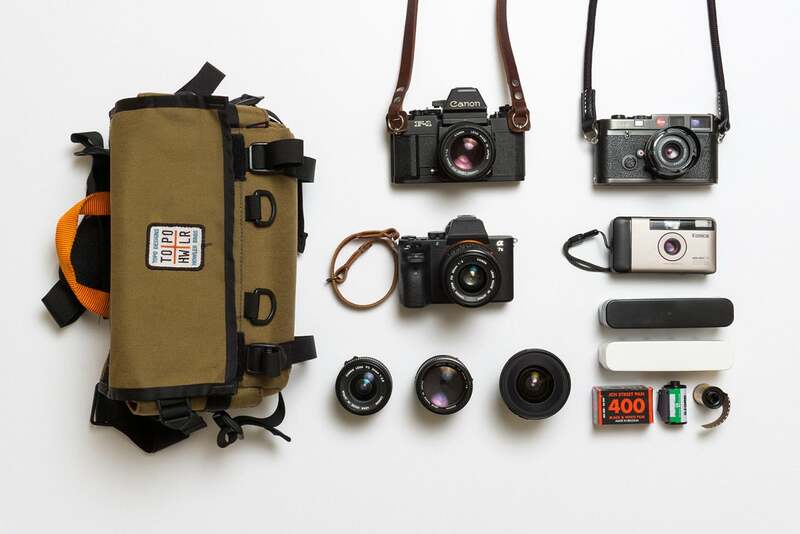 Love the bag, I always have my Bessa R4M and my Bessa R2 (I got first) in my bags. You will enjoy the 21mm f4 if you get it. Love that the frame lines are there and ready to use. Been thinking about the 35mm that you have. Love the actual bag, really like green. 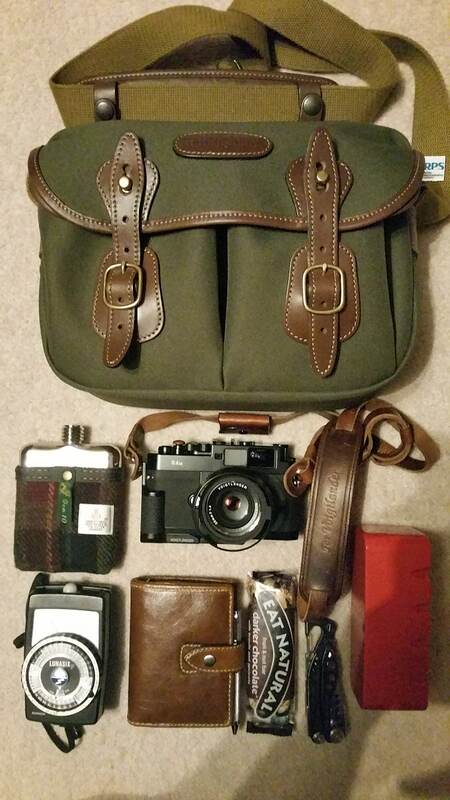 Very nice bag, I’m also very curious about the identity of the single malt! Stunning bag, inside and outside! Ha ha sounds like I’m in the company of some fellow whiskey lovers on this fine site!! Thankyou all for the kind words it’s much appreciated!! It’s a lovely and smooth speyside single malt. Highly recommended!!! Apologies for the lack of links in my article, tbh I don’t have much of an online presence for displaying my photography although I’ve just opened an instagram account so I’ll get some scans uploaded and share the link. Nice bag! I’m gonna start taking my flask with me, I have a few single malts on the go. It’s a sound plan but I find the photography gets more “abstract” the longer the flasks out haha!